In this chapter, two teacher educators share lessons learned when they adapted professional development structures for use with teacher candidates during the clinical practicum experience. Highlighted in this chapter are two field-based teacher education approaches that support the development of mutually beneficial partnerships. Teacher candidates and their cooperating teachers collaboratively used lesson study to examine mathematical discourse in an elementary setting, while teacher candidates used instructional rounds as a way for teacher candidates to observe more experienced teachers in secondary classrooms. Both structures attempted to bridge the persistent divide between university learning and clinical practice to the benefit of K-12 students, teachers, and teacher candidates. 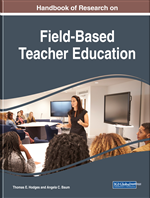 The chapter concludes with recommendations for increasing the number of teacher candidates and partnership schools involved in this field-based learning in ways beneficial to all those involved. The authors, as faculty members in a graduate-level teacher preparation program, recognized the need for more practical and structured field-experiences to complement the existing practicum structures. Portland State University’s Graduate Teacher Education Program (GTEP) clinical structure is such that teacher candidates spend one year in a classroom with a cooperating mentor teacher while engaged in graduate level education coursework. GTEP coursework begins full time in the summer and then the number of courses decreases as the number of hours in the field placement increases across the academic year. By spring, teacher candidates are in their field placement full time using a combination of a traditional apprenticeship, learn by observing and doing, approach (Hansman, 2001) and a co-teaching, learn through collaborative planning-teaching-debriefing practice, approach (Bacharach, Heck, & Dahlberg, 2010; Kanold & Larson, 2012).